Use the right mouse button to popup a new menu in the command history panel of the main window. This menu allow you to set the background colour of the panel, clear all of the text from the display or copy the contents to the windows clipboard. 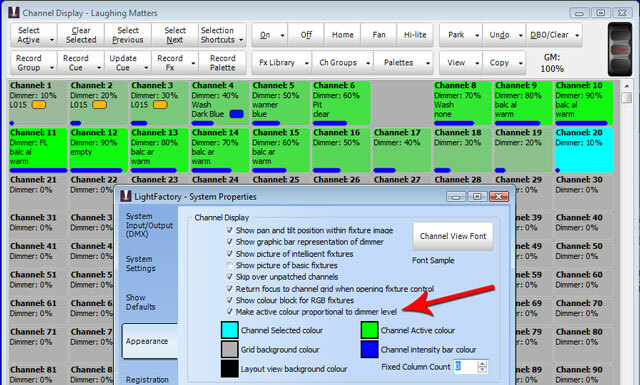 Previously in LightFactory you have had the ability to set a colour description for each channel. With 2.5 we have extended this functionality so that a real colour can also be assigned. 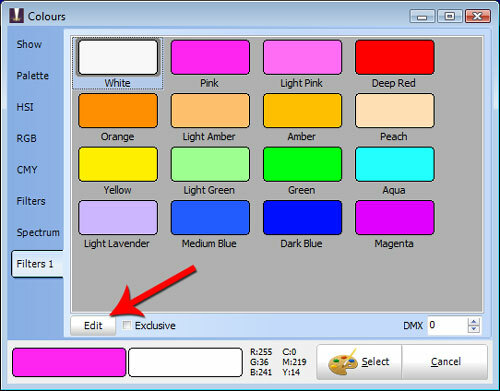 If no colour description already exists then it will automatically be populated based on the selected colour. Colours can also be entered by typing the description into the colour column of the patch window. For example typing L015 will automatically populate it will the colour corresponding to filter Lee 015. You can also type in basic colours such as "Red", "Blue", Yellow" etc into this field. Once colours have been assigned to the channel they will appear in the channel display for easy reference. For the verbose view the colour will be displayed next to the description as a small coloured block. In the character display the colour will show as the bottom line of the block with the description embedded in the colour. For the layout view the colour is shown in front of the fixture with its description below. Chase and matrix(LED) effects can now apply different behaviors. When creating a simple chase or a LED/Matrix effect you can now set the behavior that will be used during playback. Each effect can be set to the behavior of Override (Latest takes Precedence), Build, Highest takes Precedence and Inhibit. The default behavior is "Override" and is how these types of effects have played back in the past. To set the effect behavior double click on the effect name in the left of the window to open the "Effect properties" window. This window can be used to re-name the effect, set its behavior and edit the labels associated with the effect. 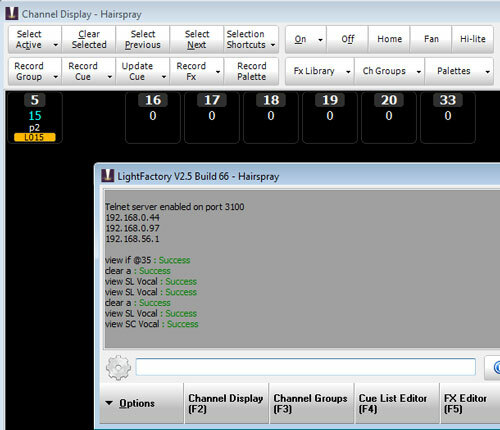 For a more detailed description of how the different behaviors apply to the lighting output see the channel groups section of the user guide. Cue lists can now play back with different behaviors. 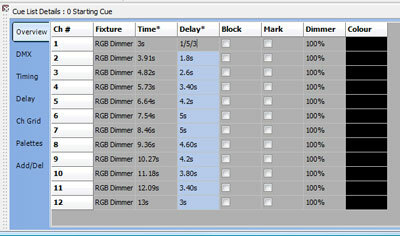 As with the new behavior options for chase and matrix effects you can now define the playback behavior for a cue list. By default cue lists play back in a "Latest Takes Precedence" behavior, however this can now be changed to Build or Highest Take Precedence. 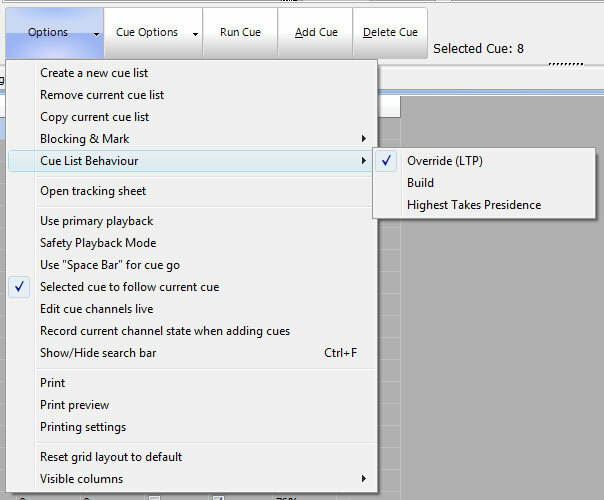 To change the playback behavior of a cue list use the options menu and select from the sub menu under "Cue List Behavior". When using the track sheet in previous versions of Lightfactory only channels are were already in the cue could be edited. This prevented editing tracked values at any point in the cue list. With version 2.5 you can now edit any value at any point. The software will work out if a channel need to be added to accommodate the change. 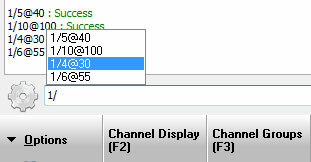 A new option below "Show tracked Values" can be used to show channels that do not currently exists in any cue within the defined range. Once shown the channel can be added by simply entering the value under the appropriate cue. The track sheet now as options for printing and exporting this information. Use the export to CSV function to create a comma separated file that can easily be imported into Excel or other applications. 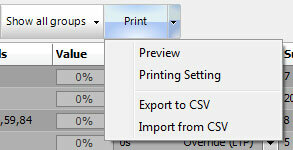 The export to CSV option has also been added to the cue list window. Effects can now be dragged directly onto shortcuts. To assign a shortcut to run an effect in previous versions of LightFactory required creating an effect playback and then assigning the shortcut to that playback. In version 2.5 you can simply drag the effect to a shortcut (click and hold your mouse button) and the corresponding payback will automatically be created in the background. This makes building a simple on-the-fly show quicker by removing the playback requirement. A new button has been added to the cue playbacks window called "Go Next". This button to do a GO on the last used playback. If no playback has been run then the first cue of the first playback will run. When the cue list reaches the last cue pressing the "Go Next" button to automatically advance to the next playback and start the cue list assigned. At any time the order can be changed by running a cue in a different playback. This functionality allows for the setup of a playlist based on several cue lists to be run as one continuous cue list. A "special shortcut" can be assigned to this button for quick access. Special shortcuts are setup in the system properties window. When recording a cue a new option is available to exclude channels and attributes that are being controlled by a submaster (channel group). 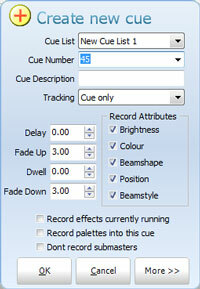 To enable this option check the box next to "Don't record submasters" in the record cue dialog window. Release options can now be filtered by selected fixtures. 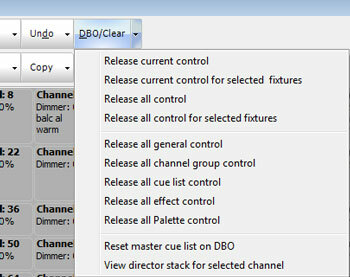 Both the release current control and release all control options can now be done on just the selected fixtures. The release options are available from the DBO/Clear menu. New appearance option will make the active colour proportional to the dimmer level. When this new option is enabled (default off) the active channel colour will be displayed proportional to the intensity level of the fixture. 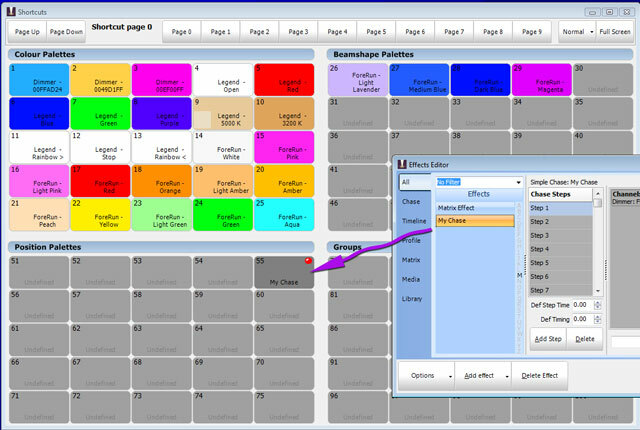 If the fixture is off no colour is displayed and if the fixture is at full the selected active colour is displayed. Some users may wish to turn off the option "Show graphic bar representation of dimmer" and use this new option as an alternative way to visually identify the output of a fixture. Architecture for Control Networks (ACN) is a suite of network protocols for theatrical control being developed by Entertainment Services and Technology Association (ESTA). Streaming ACN is layer used to send DMX data over an ACN network. In practice this is an alternative protocol for sending DMX over Ethernet networks. Improved handling of colour scrollers and direct editing. If a fixture with a colour scroller is selected (or any colour only fixture) then the colour selection popup will now automatically default to the "filters" tab showing the actual colours set in the fixture. We have also improved the logic that defines "colour only" fixtures so that this window appears more accurately. A new "Edit" button (as shown above) can be used to directly and easily edit the list of colour filters for the selected fixture. This button will popup the same attribute item editor that is used in the fixture editor. While this window is open you can continue to use the "DMX" spin edit to identify what colours are assigned to values while you are editing them. Note: Changes made to the colour list will apply globally to the fixture definition. Added right click "Move To" option to the effects playbacks to make re-ording the playbacks easier. Previously if you wanted to move effects around the playbacks window your only way was the move up/down options. With the new "Move To" option you can simply click on any other effect to swap its position. Once you have selected the "Move To" option the cursor will change to a small hand pointer indicating that you are in "move" move. The next click will be used to perform the swap. Click on any of the background to cancel the move operation. The "IF" statement is a powerful new addition to the command line interface of LightFactory. This command can be used to select fixtures by searching a mix of different parts of your show. Any combination of conditions can be specified with standard AND(&), OR(|) and NOT(!) combinations.The "IF" command will reference the position, purpose and colour description fields. It will also reference palettes and groups that are used by fixtures. If for example I apply a channel group as a position preset called "Position DSL" the "IF" statement can find it by simply typing "IF Position DSL" (not case sensitive). Here are a few examples of what can be done with the "IF" command. In the above example "Red' can mean a colour description and a palette reference. In the "Select Active" menu is a new option called "Show only selected fixtures (view)". Selecting this option will remove all but the selected fixtures from the channel grid. At any time the clear button can be used to restore the view back to all channels. This new filtered display option is also extended with the use of the "View" command. The "View" command can filter the channel display by a group name, group number or an if statement. 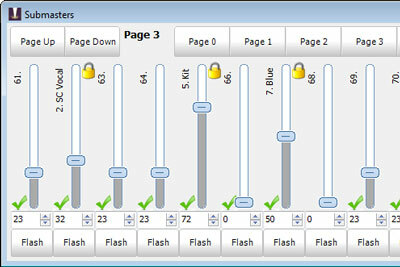 view SC Vocal - Display only the channels in the group labeled "SC Vocal"
This feature has been available for the shortcut page from version 1. By right clicking on a submaster you can toggle the lock option. A locked submaster will appear on all pages providing access to this functionality at all times. A small padlock will appear in the top right to indicate if a submaster is currently locked. This new bar will automatically appear if either the Enttec/Cooper control program wing or the Elation MIDIcon is connected. Enabling MIDI clock in the external triggers will cause the incoming clock messages to set the tap tempo within Lightfactory. If the clock signal changes by 100ms then the tempo will reset to the new timing. Use the clock divisor setting to slow the tempo generated by the MIDI clock. 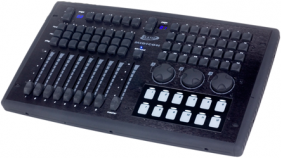 Native support for the new Elation MIDIcon device has been added to LightFactory. 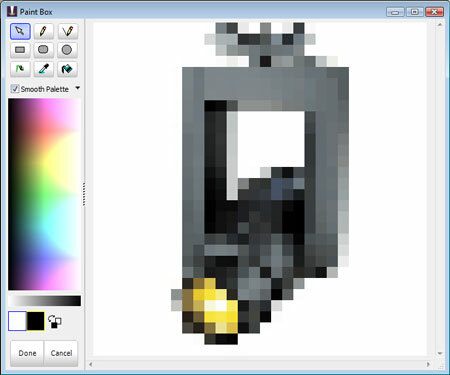 The new paint box window is a simple image editor tool that can be used to customize pictures used in the software. In the shortcut window you can now right click on the shortcut and select "Edit Image" from the menu to directly change the image without needing to go out into another paint program. 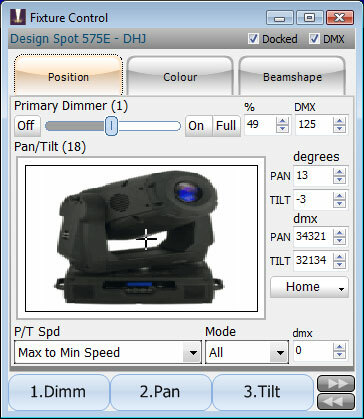 The new paint box window can also be accessed when editing gobo images in the fixture editor. Right click on any attribute item and select "Edit Image" to bring up this new window. A new option under the print menu of the channel groups window allows you to export and import the group information in a standard comma delimited (CSV) file format. As you type a command into Lightfactory a popup will show you all of the previous matches to the partial text. You can then use the up and down arrow to select a previously typed command for editing. This function eliminates re-typing long commands and provides quick access to the command history. A new option has been added to the selection menu in the channel display called "Interleave Selection". This will allow for custom selection based on the number of fixtures and a cluster value. For example you can select every 5th fixture in clusters of 3. When entering timing information into the cue list channel detail or the group channel detail you can now use syntax to stagger this over a number of fixtures. Simply select the fixtures you want to stagger and then enter the syntax "from value / mid value / end value" to set timing. For example if you enter "3/13" the timing will be staggered between 3 second and 13 seconds as shown in the time column in the image above. If you enter "1/5/3" the timing will be staggered between 1 second, 5 seconds and then back down to 3 seconds as sown in the delay column above.